Due to a high volume of students accessing the Housing Application, our servers may be running slow or delayed. If you have trouble accessing the housing application we encourage you to try again later. All students who submit an application by the priority deadline (March 10 for Living Learning/Themed Communities and April 1 for General Housing) will receive a reservation time. Reservation times are distributed at random so applying today vs. applying in a few weeks will not harm your chances at receiving housing. Newly Admitted Students: If you were recently admitted to the university, it is possible that you haven’t received full access to your CIS page and are unable to access the housing section of your student homepage. We encourage you to check back and try again in a few days. We are aware of this issue and are working to fix it. Thank you for your understanding and we apologize for any frustration this may cause. Classes will resume tomorrow along with full university services and dining hours. The MHC Front Desk will close tonight between 11:00pm-7:00am. Residents in the MHC can contact their RA or the Lassonde Front Desk for any needs they may have tonight. UPDATE: Due to inclement weather and snow, the University of Utah will be closed ALL DAY today, Wednesday, February 6, 2019. All Wednesday classes have been cancelled. 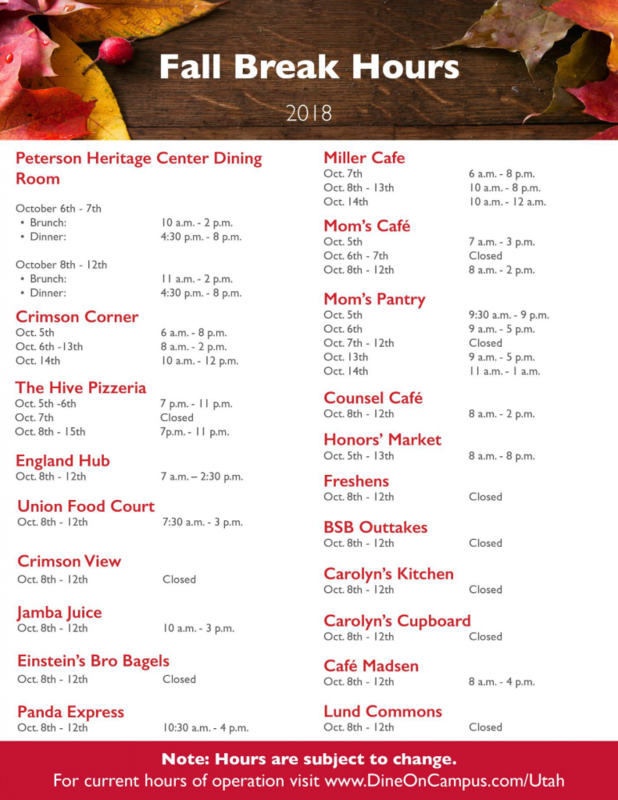 The PHC Dining Hall, MHC Honors Market, and Miller Cafe at Lassonde Studios are remaining open during this closure. 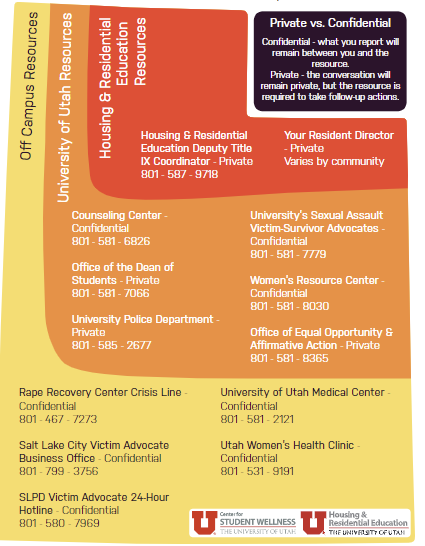 All university updates will be updated here: http://alert.utah.edu/ . Please refer to the campus alert system for the most up to date and accurate information. Updates related to housing and dining areas will continue to be shared with residents and on this web page. Do you know someone who should live on-campus? Tell them about why living on campus is awesome, and you will earn a $200 credit! 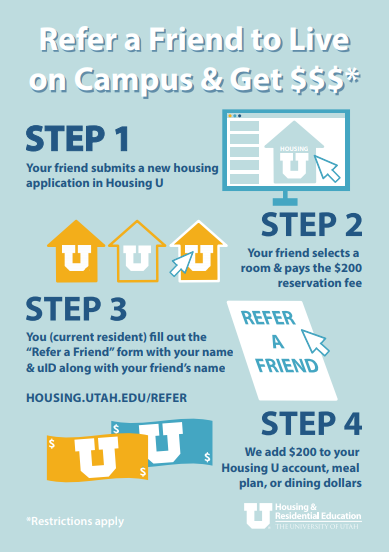 The student you refer must be new to living on campus, and reserve their room on or after December 1, 2018. For more information and to submit your friend’s information, click here! As you may be aware, CIS is currently down. This means that while CIS is down, you will not be able to access Housing U. Please know that campus IT is working to remedy this issue as quickly as possible. 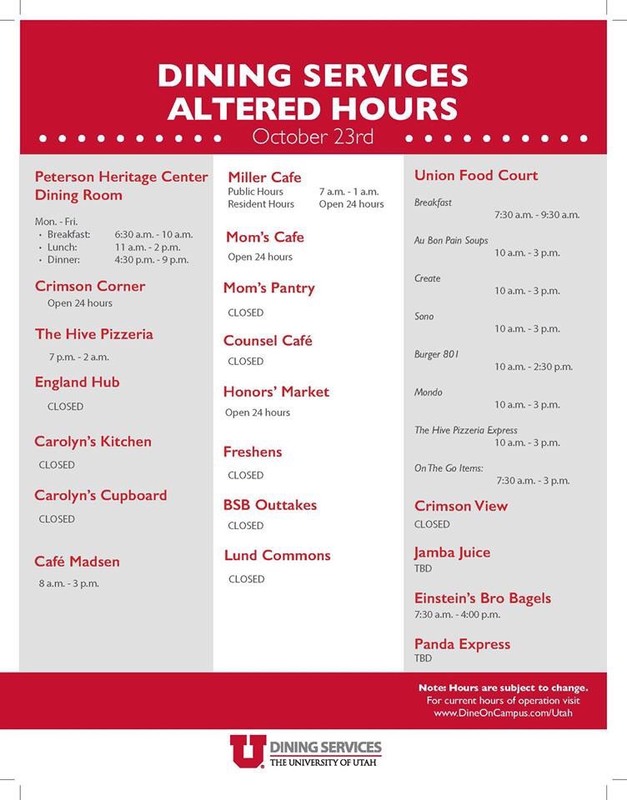 Dining Hours for today, Wednesday, October 23 have been adjusted. Please review those updates here. The Associated Students of the University of Utah and our Athletics Department are planning a vigil for Lauren on Wednesday at 5 p.m. on the steps of the Park Building in President’s Circle. RHA is organizing a group of students to walk down to the vigil together. Residents are encouraged to meet outside of the PHC at 4:00pm. The group will stop at the MHC and Lassonde on the way down to the Park Building. 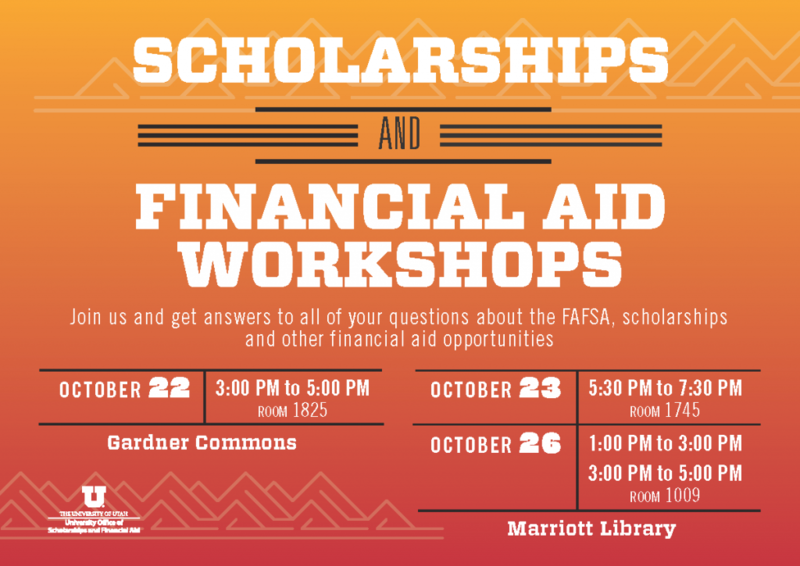 The Office of Scholarships and Financial Aid is holding helpful workshops to help answer your questions about financial aid and scholarship opportunities. See dates and locations of the events below. 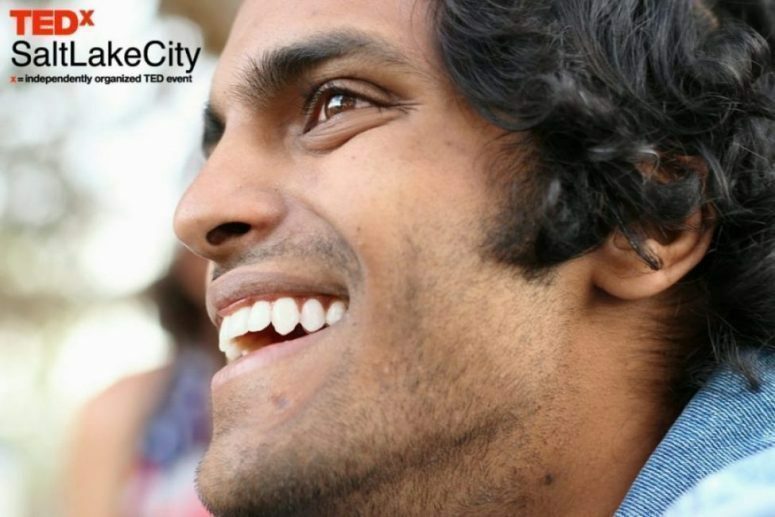 Mohan Sudabattula is a speaker at TEDxSaltLake City 2018 on September 8, 2018. An undergraduate student at the University of Utah pursuing honors in Biology, Philosophy, and Health, Society and Policy, he is also the Founder and Executive Director of Project Embrace, an international medical nonprofit organization dedicated to the reduction of global health disparities and promotion of sustainable health care practices. Mohan’s talk will present #AtTheEdge solutions for global health needs from an unexpected source: trash. There are a few important updates to campus shuttle routes, please click here for more information. Read more about Transportation Updates here. Map of closed sidewalk, alternative route. 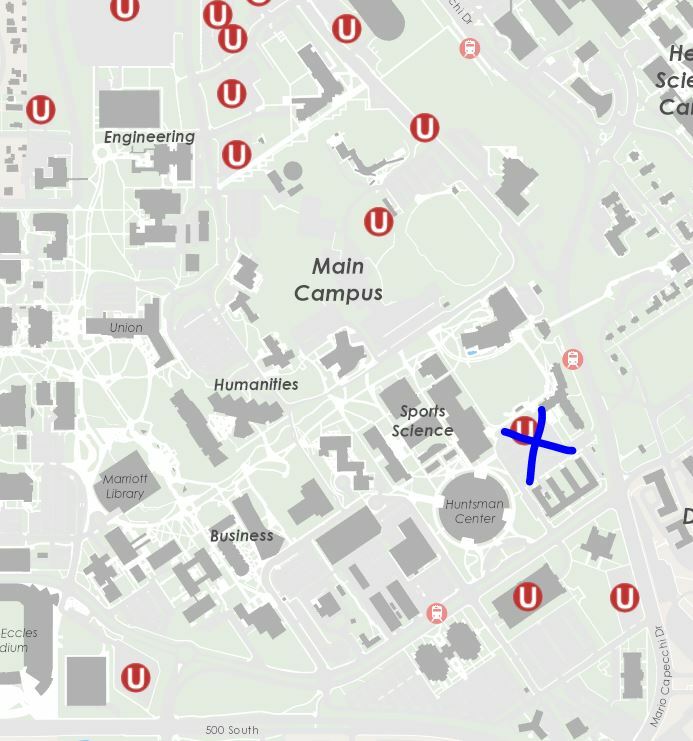 Map of alternative U-Lots to park in on August 5th and 6th. There are a few updates to the Wasatch Drive and Mario Capecchi construction project. Summer residents in Lassonde Studios should stay aware of these updates. Click here to review the construction impact map. There will be a variety of construction updates occurring around campus this summer that may impact summer residents. For a list of projects that HRE is aware of, but not coordinating, please click here.